I have been carping for as long as I could remember. When were kids, a buddy of mine lived next to a big river (the Ohio) and we could go there and fish all the time. I can remember catching tons of carp on home made dough bait....just a simple dough ad vanilla extract added...worked like a charm. We didn't catc many big fish but we sure had a lot of fun. fast forward to today and I am still a carp fan. There is nothing quite like a big carp run on light tackle. I do have some European rods now coupled with Penn reels and I love it. 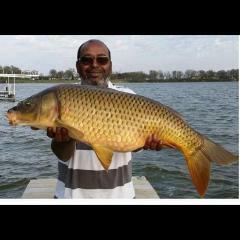 I would venture a guess that more than half of my fishing time is dedicated to carp. I do chase trout in the spring and catfish here and there...plus fishing for bluegills for bait is always fun too. But big carp is the one species I prob focus most of my time on...and it is truly rewarding. sorry guys.....I have my moments.....I have been fishing for decades.......I catch a lot of fish...... my goal has always been to be more consistent.......I can catch them....I want to catch them all the time If you want to tell me a thing....be prepared to come show me....or it is all big talk....show me. Well thanks Brian.... it's like this.... The carp here are not used to eating boilies.....they will eat them....I have proven that. However....they are very suspicious of them. It is a new thing. It' not like in England or the EU where people feed them tons of boilies per year.....that is just not how it is and they are not a natural thing.....we know this....you should know this too. Getting a carp to bite on a boilie here is like getting a bass to bite on a nightcrawler....yes it is within their dietary requirements....but they are not sold on the idea just yet. Use them.....they will work. Will you report back astounding successes?....not likely....but you will catch fish. Anyone that wants to tout that boilies are the best thing since sliced bread have never fished my waters.....that is just not the case.....shal I re-poost the above? It takes time and there are rewards......but it is not magic and it does not happen over night well just because it needs to be re-affirmed.... I have a couple bags of "the Key" stabilized and I have caught fish on them....I generally run a couple handfuls through the "Korda Krusher" and add them to my spomb mixes. Now I will say....I use a lot of small betain HNV pellets in my spod mix....I actually have some 20 mm I sometimes band onto the hook but I have not had any hook ups with that method "yet". They are a fishmeal pellet with betain sugars....it sounds logical to me and logic is what builds my confidence in a bait. My spod mix is generally prepared field corn, crushed boilies, pellet, and some of my "goo"....which is wetted, stale Italian bread and raw bran. When I boil my field corn, I always add in a handful of star anise clusters....my wife hates it when I do that....lol...the house ends up being pretty funky when I cook field corn. I have used halibut pellets but as of yet....have not scored a fish on them....but I have confidence they will work so will continue to use them. I also have a couple jars of HNV betain hookbaits (14mm I think). I also have faith in those....but still have not had the big bite on them. I have a couple bottles of CC Moore feed stim and big bottle of hemp oil that I sometimes use....I also sometimes glug with a liquid corn deer attractant...it's basically like a molasses and has added vitamins and minerals. All of that being said, my biggest fish and my most regular catches....come on a hair rig filled with sweetcorn fished over beds of the above. I give all of them a shot but facts are facts....If I am fishing 3 rods...I am generally fishing 3 different baits and the rod that will always out perform the others is the rod with the sweetcorn on the hair. This is just the facts of my personal experience. do you get it yet? I have a couple bags of "the Key" stabilized and I have caught fish on them....I generally run a couple handfuls through the "Korda Krusher" and add them to my spomb mixes. Now I will say....I use a lot of small betain HNV pellets in my spod mix....I actually have some 20 mm I sometimes band onto the hook but I have not had any hook ups with that method "yet". They are a fishmeal pellet with betain sugars....it sounds logical to me and logic is what builds my confidence in a bait. My spod mix is generally prepared field corn, crushed boilies, pellet, and some of my "goo"....which is wetted, stale Italian bread and raw bran. When I boil my field corn, I always add in a handful of star anise clusters....my wife hates it when I do that....lol...the house ends up being pretty funky when I cook field corn. I have used halibut pellets but as of yet....have not scored a fish on them....but I have confidence they will work so will continue to use them. I also have a couple jars of HNV betain hookbaits (14mm I think). I also have faith in those....but still have not had the big bite on them. I have a couple bottles of CC Moore feed stim and big bottle of hemp oil that I sometimes use....I also sometimes glug with a liquid corn deer attractant...it's basically like a molasses and has added vitamins and minerals. All of that being said, my biggest fish and my most regular catches....come on a hair rig filled with sweetcorn fished over beds of the above. I give all of them a shot but facts are facts....If I am fishing 3 rods...I am generally fishing 3 different baits and the rod that will always out perform the others is the rod with the sweetcorn on the hair. This is just the facts of my personal experience. I have had some luck with boilies but all of my best fish came on plain old canned sweetcorn that I usually fish over a bed of cooked and flavored field corn. I guess one advantage to boilies is that small fish can't steal your bait...but as said above, conditioning fish to eat boilies could be an expensive proposition unless there is one venue you consistently fish. I fish a lot of different places and going back regularly to throw in food is not really an option. Lmao....I'm kinda stingy on the secret places! I went back yesterday (self employment does have it's advantages) for about 3 hours and put another dozen + in the freezer. Just using a little 7 foot light weight spinner, 6# test fluoro line, a thill bobber about 2 foot above a number 8 long shank gold hook and tiny pieces of worm.....I did use a 1/64 ounce jig with a bit of worm on it and it did just as well.....till I snagged it on a sunken branch and lost it. The long shank gold eagle claw hooks are way cheaper than the jigs. I generally use the jigs with Berkley Gulp alive "fry" when the gills are super aggressive. I am looking forward to going out there and giving it a full on carper introduction and see what I can get. It is an odd shaped pond....(they call it a lake but to me, it is just a large pond) It's shaped like a kidney....well that's not quite right....more like a reverse "C" shape when viewed on google maps....the "dam" is the top of the "c". If I had to guess cause I can't find much info on it...I'd say it is maybe 2 acres? That's pushing it. I haven't plumbed it for depth officially. Just based on how long it takes an average weight to drop to the bottom near the "dam"...I'd say 10-12 feet tops. It is not maintained....there are tree falls all over the shores....which is absolutely fantastic for catching 'gills for bait. Tree falls = bluegill....always. Kinda hazardous for your rigs but the rigs are super cheap. I am kind of excited to get out there with full on carp kit and go for it. I have not yet seen anything indicating carp but I am willing (and hopeful) that the fellow I met out there wasn't full of BS.